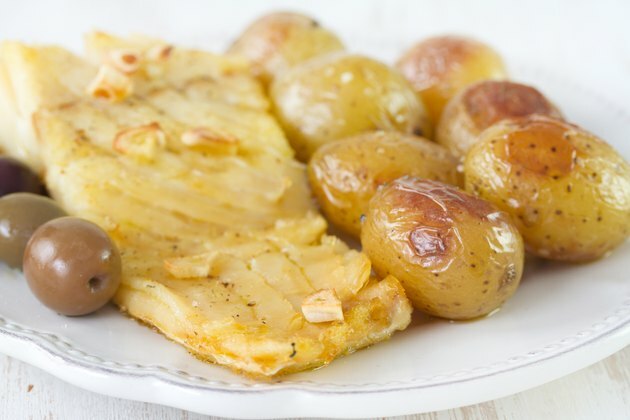 Serve your family and friends potato dishes made with pure white potatoes that have not developed dark spots or turned a gray color during preparation. Once potatoes are peeled, they will darken if not cooked immediately. This is due to a chemical reaction between carbohydrates in the potatoes and oxygen in the air. Preventing the darkening begins with storing the potatoes correctly at home, and handling them quickly after peeling and before cooking. Wash the potatoes with a vegetable brush under clear running water, peel them and remove the eyes. Trim off any green skin that may be on the potatoes. If the peeled potatoes won't be cooked immediately, then place them in a bowl of cold water that completely covers the potatoes. Cover them and store in the refrigerator for use within 2 days in the recipe of your choice. Prepare the potatoes immediately by cutting them in the desired fashion, placing them in a stainless steel pot and covering them with cold water. Starting them in cold water makes for even and uniform cooking. Drain the potatoes thoroughly in a colander immediately after boiling them. Return the potatoes to the pot they were boiled in and set the burner to low. Heat the potatoes for several minutes, turning them regularly with a spatula to keep them from sticking to the pan. Continue heating the potatoes until the excess moisture is gone. Prepare them immediately in the recipe of your choice. Store uncooked potatoes at home for long periods in a darkened room at temperatures between 40 to 50 degrees Fahrenheit. Mashed potatoes are fluffier and more visually appealing when the cooked potatoes are completely dry before mashing them. Do not rinse or quick-cool cooked potatoes in a cold water soak, as this can cause them to become soggy. Keeping the potatoes from turning dark by covering them with water only slows down the darkening process; it does not prevent it. Storing uncooked potatoes below 40 degrees Fahrenheit causes them to blacken. Avoid potatoes that are bruised, have cuts or dark spots.